From Siddharth to Sakyamuni and finally to the Enlightened, One Buddha-an incredible transformation of a prince to an enlightened teacher, who walked on the earth, more than 2500 years ago. Born in Lumbini, Nepal this Prince was moved by sorrow, misery, pain and death, in the Prime of his youth, decided to discoverthe causes and the means to overcome their occurrences. Buddha set off, leaving home and family, renouncing worldly pleasures and travelled from place to place until finally he attained enlightenment by meditating under the Bodhi Tree. He then preached the truth he discovered and exhorted his disciples to follow the Eight Fold Path forthe cessation ofthe endless cycle of birth and re-birth. This coach takes you through the most prominent Buddhist sites through which Buddhism spread as a religion, not only in India but beyond its frontiers. Lord Buddha was born at Lumbini, his mother (Maya Devi) give birth to Gautam under a tree while she was on her way to her parental home from Kapilvastu. 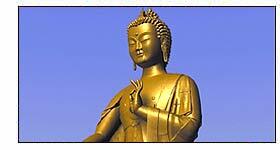 It is said that it was here at the Grihkuta hills that many enlightened sermons were given by Buddha. It was one of the oldest universities of the world, Lord Buddha visited this place. It was here that Sakyamuni (Gautam Buddha) entered into meditation. The giant Bodhi Tree (peepal) under which, sitting on a raised platform, Prince Siddharth meditated and finally attained Nin/ana (Enlightenment). Disciples were surprised to see the mesmerisingly glowing countenance of the Buddha. Sravasti was the capital of the ancient kingdom of kosala and sheltered the Buddha for 24 rainy seasons in the jetvana Gardens. On a full moon night of Magh the legend informed his Sangha and declared that he is going to leave the mortal world soon, and then the Tathagata, the reciter of truth, breathed his last. On Arrival at Gaya lntl airport, transferto Hotel. 2000 hrs : Transfer to Hotel. Dinner & overnight stay at Hotel. 0700 hrs :Breakfast at Hotel. 0900 hrs. :Leave for Raigir- capital of powerful kingdom of Magadha. 1230 hrs : Lunch at local Restaurant. 1330 hrs. : Sightseeing of Nalanda ruins & University. 1800 hrs. : Arrival at Patna. Check·in at Hotel. 1900 hrs. : Dinner at Hotel. Overnight stay at Hotel in Patna. 0600 hrs : Breakfast at Hotel. 0700 hrs. : Leave tor Kushinagar enroute visit to Vaishali. 1200 hrs. :Lunch at local restaurant in midway. 1900 hrs. : Check-in at Hotel. Dinner at Hotel. Overnight stay at Hotel. 0700 hrs : Breakfast at Hotel. 0800 hrs :.Leave for Lumbini. 1200 hrs. :Arrival at Lumbini. Check·in at Hotel. Lunch at Hotel. 1400 hrs. 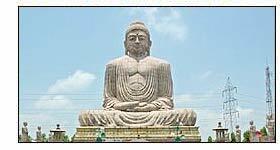 : Sightseeing of birth places of Lord Buddha & Maya Devi Temple. 1700 hrs. : Arrival at Hotel. Check-in at Hotel. 1900 hrs. : Dinner at Hotel. Overnight stay at Hotel. 0800 hrs : Leave tor Sravasti enroute visit of Kapilvastu. 1300 hrs. : Arrival at Sravasti. Check-in at Hotel. Lunch at Hotel. 1500 hrs. : Sightseeing ot Sahel Mahet (Jetvanaram) & Angulimal caves. 1900 hrs. : Arrival at Hotel. Dinner at hotel. Overnight stay at Hotel. 0600 hrs :.Breakfast at Hotel. 0700 hrs. : Leave hotel for Varanasi. 1200 hrs. : Lunch at midway restaurant or Pack Lunch. 1500 hrs. : Arrival at Varanasi, proceed tor Sarnath visit. 1600 hrs. : Sightseeing ot Sarnath & Dhamek stupa. 1930 hrs. : Arrival at hotel. Check-in at hotel. 2000 hrs. : Dinner & overnight stay at hotel. 0630 hrs. : Arrival at Hotel. Breakfast at Hotel. 0730 hrs. : Leave Hotel tor Bodhgaya. 1400 hrs. : Arrival Hotel for Bodhgaya. Check-in at hotel. Lunch at Hotel. 1500 hrs. : Leave hotel tor sightseeing ot Dungeswari caves & Niraniana river. 1800 hrs. : Arrival at Hotel. 1900 hrs : Dinner & overnight stay at hotel. 0800 hrs. : Leave Hotel tor transterto International airport.